Life is all about online marketing (did I go too far?). Content, PPC, social media, lead nurturing, you name it, are the ways to interact with your audience. And the marketing automation tool for the job, is Hubspot, my favorite. For those of you who haven’t seen our previous blogs, Hubspot is an inbound marketing software platform that can help your company attract new online visitors, generate leads, and close sales. At Marketing Envy, I’m the ‘HubSpot Support’ guru, and when I’m not busy helping clients grow their businesses, I study this marvelous platform that combines marketing and sales into one. In my study, I’ve come across a few hidden gems that you don’t necessarily realize at first or even second glance. Where are your leads from? You can automatically determine the country and/or state of a lead based on their IP address. So from now on, instead of asking visitors what country they’re from - ask them something more relevant like - when they plan to implement a solution similar to yours. Projects: Whenever you have a new marketing project, you can use Hubspot to set up the new project with an easy checklist for implementation. Build your own projects, and even assign them to other team members for execution. Block Emails: You don’t have to deal with spam. Hubspot allows you to easily block “free” emails to ensure that you get the best quality leads. Stop Google from indexing your pages: Not every page on your website has to be open for Google consumption. For example, you might want to use duplicate landing pages for different campaigns. Google might see this as duplicate content and penalize your website. You can block specific pages on your website from being indexed by search engines, this is how. Prevent email overload : Hubspot stops your company from becoming an email spammer by allowing you to control how many emails a contact receives, even if they’re signed up for emails on multiple workflows and lists. Send SMSs to sales: You’re having a super sensitive campaign and all the leads should get an email within the hour? Why not send an SMS to the relevant sales person as the lead arrives - this is an awesome yet underused option in the workflows. Lead Flow: A new Hubspot feature is the Lead Flow popup, which helps you capture more leads on your website by adding a simple contact form, no coding required. It’s relatively basic at this point but the product is fast developing to be one of the strongest engagement tools in your arsenal. Visits to Contacts: It’s great that you’re constantly improving at bringing those super relevant organic leads - but what about increasing your conversion rates? Don’t forget to check the visits to contacts ratio on your sources report. Recipes: If you’re not sure how to setup new workflows or marketing campaigns, Hubspot provides basic recipes that you can follow and use until you get comfortable. Instead of starting a new workflow, click the “recipe” button next to it. Prospects on CRM: You can analyze which websites your visitors are coming from to help you turn them into customers. 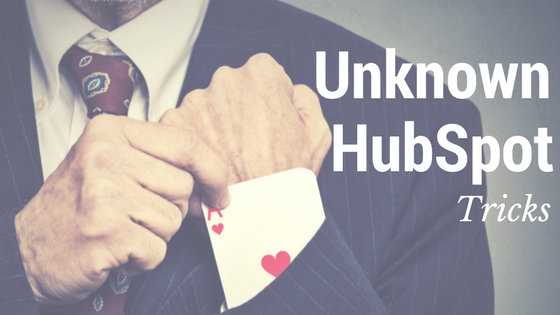 If you too are a HubSpot fan and know of hidden features, I’d love to explore them!